The Red Indian fish can reach a maximum length of 35cm. The ones I have seen have all been around 20-25cm. They range in colour from a scarlet, brick red to an orange colour. Sometimes they have black and/or white spots as well. 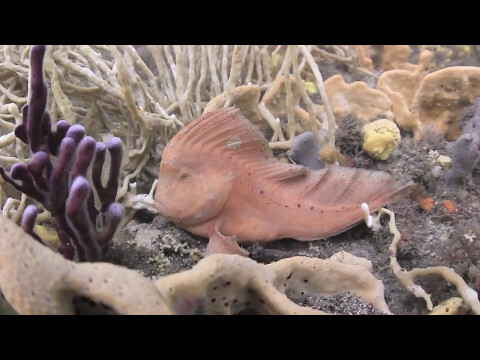 The fish looks remarkably like a piece of sponge. The fish's dorsal fin stretches the entire length of its body and gives it the appearance of wearing a North American Indian chief's headdress. Therefore, the fish does indeed look like a Red Indian. The Red Indian fish is only found in Australian waters, and from Moreton Bay in Queensland to Durras on the NSW South Coast. They also appear from South Australia around to Shark Bay in Western Australia. Most in Botany Bay is found at between 10m and18m. 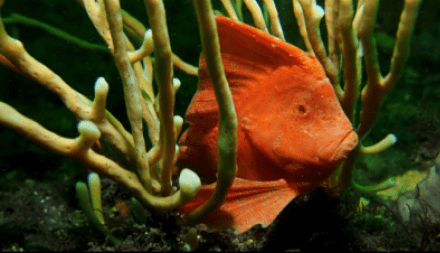 The Red Indian fish usually sits still on the bottom next to a sponge that it resembles. When found it does not move but remains motionless on the bottom. The Red Indian fish can swim but when it does it looks like a dead leaf sinking through the water.